If you think this can be a very simple thing as to WHY your cheque may bounce… it is not. There are lot of factors to it, and here I am discussing the same today. Or atleast we think we know but at times ignore some important things for dishonour of cheque. Here are 6 main reasons why your cheque bounced. Cheques are used by a vast majority of people having bank accounts, and with the recent initiative of the Jan Dhan Yojana by Prime Minister Narendra Modi, the number of Indians with bank accounts has gone up. While not all people having a bank account use cheques, most us do so and we think we know all about writing cheques while infact a lot of us don’t. 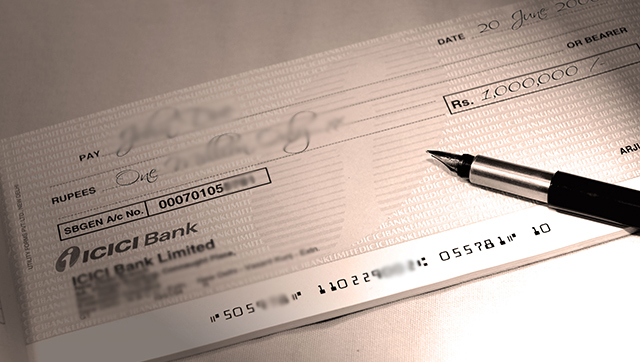 Even if we do know about writing cheques, are we fully aware of reasons why a cheque bounces? Or what is a bounced cheque? Well a bounced cheque simply means a cheque that the bank refuses to pass or honour and is intimated to the issuer and the receiver and a nominal penalty is charged. A bounced cheque also invites legal action is the receiver wishes so, and there are often cases where in cheque dishonour of significant amounts has invited criminal charges. Hence it becomes vital for one to know the typical reasons why a cheque can bounce. Lack of funds in the account from which the cheque is issued is among the main and most common reasons for the cheque to bounce. If you have issued or have received a cheque linked to an account that has less amount of money than the once written on the cheque, then the bank will not find the enough money to complete the transaction and hence will stop the payment and dishonour the cheque. It will also levy a nominal penalty on both parties – the issuer and the depositor for this. After this the issuer can either issue a new cheque or settle the matter with the receiver/depositor of the cheque; or the receiver of the cheque has an option to initiate legal action against the issuer for non-payment and dishonour of the cheque. Hence it is advised to always be careful while issuing the cheques and make sure you have sufficient balance in the account. As discussed in our post ‘How to Write a Cheque in India’; the date is very important part of the cheque and any difference or problem in the date will lead to your cheque being bounced. Yes, date can lead to a bounced cheque. The typical problem with the date can be that the date is disfigured or has some mistake, or is not readable or scribbled, will lead to your cheque bouncing. Also, the other reason is that the date has expired or in other words, the date on the cheque is more than 3 months old, from the current date. A cheque is only valid for 3 months from the date that is mentioned in its date column. For example if the date on the cheque is mentioned as 12/02/2015 then it will be valid only till 11/05/2015. So with that requirement, if you have a cheque with a date 11/11/2014; that cheque is not valid as of 12 Feb 2015. In such a case where a cheque with an expired date is submitted, the bank will dishonour the cheque. Also Read: How to write a cheque in India? The other issue is Post Dated Cheques being deposited earlier than they are due. Post Dated Cheques or PDC are cheques where cheque is issued for a future date. For example, I could issue a cheque to you on the 12th of Feb 2015 for any date in the future; like say for instance 14th November 2015. If you were to then deposit the cheque anytime before 14th of November 2015, then the bank will dishonour the cheque and the cheque will bounce. Again, a very common reason for a cheque to bounce in India. If the signature is mismatched, or does not match the banks records, then your cheque will bounce. Signature is very important and we also discussed this part in ‘How to write a cheque in India’ article. If the signature is not as per the bank records then they will dishonour your cheque. Also if you happen to sign on the MICR Band on the cheque, then the cheque will bounce. So be careful with the signatures. If the cheque happens to have any difference in the amount payable mentioned in words and in numbers, then banks will bounce you cheque. This is also true if the amount mentioned in the words section, has numbers in it in any form and also if the amount in figures/numbers column has any words written in that. For example: If you have a cheque wherein the amount written in the ‘Words’ section is say ‘Fifteen Thousand two hundred ninety nine’ only and the amount in figures mentioned in the amount column is 16,000/-; your cheque will be dishonoured, since the amounts do not match up. If the cheque is damaged, torn, disfigured meaning it is not in a good condition or has some details not clearly visible; has too many stains for whatever reason etc., these types of cheques will bounce. So preserve the cheques properly. Any kind of scribbling, overwriting, correction etc on a cheque is not allowed and if a cheque is found that way, it will be dishonoured. It is always good to issue a fresh cheque if you make a mistake while writing it. Also while receiving a cheque that has such thing, then ask for a new cheque. These are typically the reasons for a cheque to bounce in India and it is good to know these, to stay away from any unwanted hassle or trouble. Apart from the above reasons, if the bank finds the cheque to be suspicious or forged for some reason, it will dishonour the cheque, resulting in a bounced cheque. Are there any other common reasons for a cheque to bounce or anything important I may have missed? Please feel free to leave it in the comments section below. It would most likely pass, since you would also have to attach a slip with it, which will have your account number. Dear Sir, Can you answer to my following question? I have issued a cheque to one of my payee. During submission of the said cheque to the bank, if the the payee made some mistake in writing the cheque deposit challan to be attached with the cheque,should I be responsible for it and should I be penalised for the same? A certain amount has been debited for such reason from my bank account. I’m waiting for your reply. Thank you. My name on the issued check is slightly different from the account holder’s name (though it’s the same person). Will it get bounced?? How can I redeposit the check if the check bounced?? I’m not in contact with the doner so I may not get him to write another check. If the difference minor like for example the name is Jon Doe Smith and the cheque is Jon Smith – it will get passed as at times the account number to which the cheque is being deposited in and the first and last name of the holder is matched. However, if there is a spelling mistake or some other issue, the bank may or may not pass it, depending on the kind of error there is on the cheque. Hi, if I wrote in black ink on the cheque, then will my cheque gets dishonour? No, your cheque will not be dishonoured because of the colour of the ink. I have received my salary chq of amount Rs.12,381/- but in words it has been Twelve thousand Three Hundred only. What should i do. Because our company boss comes here once in a month. For new cheque i have to wait till next month. I cant wait for whole month. Please help. You will have to get a new cheque as this one won’t pass. There is no other option. Unless there is another person authorised to give a new cheque with correct amount in Words and Numbers. If the cheque is written in every sense correctly and there is sufficient fund to clear the cheque and by mistake if the presenting bank claim a high amount and the cheque got bounced can the cheque issued party be penalised for none of the mistakes from his side. If the bank is at fault, then the parties won’t be penalised. But it has to be clearly established that such a thing has happened and there is no other reason for the cheque to bounce. If the receiver forgets to write the name on the cheque and deposits it, will he (and the issuer as well) be penalised on this case? If the name on the cheque is missed, chances are the bank will return it. If the cheque is returned, both parties are penalised. The penalty depends on the amount of cheque and varies from bank to bank, while some banks have a flat charge, some have a % they charge. The best solution is to ask for a new one. There is no way to get a torn cheque approved. is it posible that the cheque will bounce if it’s not written in his name . for ex. a wrote a company name in the cheque but i deposited it in a persons name . because the company has no given account number . Are there some cheques which don’t require a siginiture? I have seen some cheque not requiring any signature at all and when deposited they are correctly paid. I rec’d a cheque from my client, where the amt Rs.23,345, but in words he has written twenty three three hundred and forty five only… Will it bounce ?? There’s a good chance it may bounce. If a person who has issued me a cheque which has bounced and now says that I don’t have any money with me, what happens when I go to the court? If he/she gives the same argument in court that there is no money, what ruling does the court give. Will I get my money? This depends on case to case basis and the severity of the circumstances. No, the cheque will not bounce and and & are both OK. There is slit mistake in Name. will the cheque get bounce? I got from you useful messages. I really appreciate your all previous comments and replies . . . But I want to know about what is the reason for cheque leaves are bounce? Full details. I heard about it there are 11 reasons are there for bounce reason in cheque book. Please can you clear to me this doubts. if the account Seized then cheque bounce NI-138 is applicable or not. Technically the cheque shouldn’t clear. However in case of minor or regular transactions or in case of old customers, banks sometimes clarify these issues with them and if all feels right, they clear it. So it depends on bank to bank. But from a technical point of view, if should not pass. Can a cheque get dishonoured if there is any spelling error in the cheque, such as if forty is spelled as fourty ? Forty and Fourty are both acceptable as one is American English and the other is British English. These kind of mistakes are OK but if you completely mess up a spelling of the receiver or the sum in words, then it is most likely to bounce. Very Nice Information. I want to ask a question. I have received a cheque of Rs. 6000/- but the person had put wrong date. So he cancelled the date and corrected it by writing it in the space above the date box with his signature. Will it be valid? Or should I get another cheque?? Ideally get a fresh cheque. The reason is that while the signing above a correction is a very old method, some banks, especially with a newer or younger staff do not appreciate the practice. So to be absolutely sure, go for a fresh cheque to avoid any bounced cheques. Thank you very much for your prompt reply and help. if we use blue ink for signature and black ink for writing other details on the cheque for RTGS purpose will the cheque be valid or it will get rejected. In most cases it should not be a major problem. However it can be objected if the bank feels the transaction is suspicious. If I write cheque in favour of. …..In black ink and amount…In blue ink then it will get sanction or will be cancelled..? Generally it won’t matter that much, unless the amount is big or the banks doubt some suspicious activity. It is however recommended to use same ink as far as possible to be 100% sure of your cheque being cleared. By mistake i have made RTGS of RS 1600000/- to other customer instead of my customer. wHat is the solution please reply me its a serious matter. The trouble with RTGS is that the transfer is instant. So in this case if you are able to contact the person to whom you wrongly transferred the money, and if he agrees to transfer the money back then that is the easiest way out. Other than that you will have to involve your bank and a visit to the branch manager will be your only option. He/she will definitely initiate a process to contact the receiver and guide to get your money back.